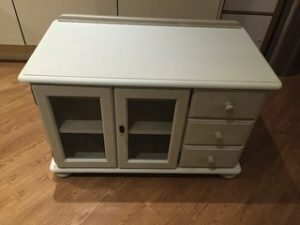 A small solid pine bedside chest of drawers, having three hand painted white drawers with circular knobs. 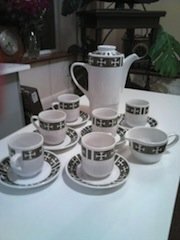 A white and grey patterned ceramic tea set, includes a large teapot, a milk jug, six teacups and six saucers. 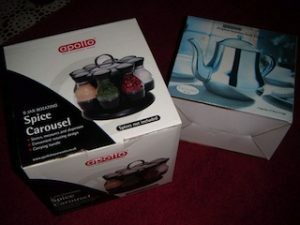 A brand new boxed Apollo black and chrome 8 jar rotating spice rack, together with a brand new stainless steel teapot. 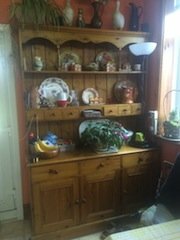 A tall standing solid pine farmhouse kitchen dresser, having two plates shelves above six small drawers, three drawers to the bottom above a double and single cupboard. 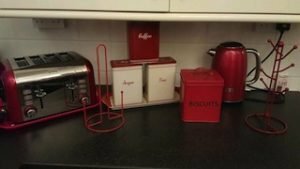 A collection of red kitchen accessories, to include a kettle, a four slice toaster, a kitchen roll holder, a biscuit tin etc. 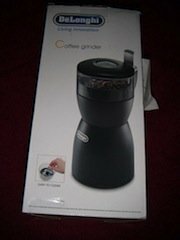 A brand new boxed DeLonghi Living Innovation black coffee grinder. 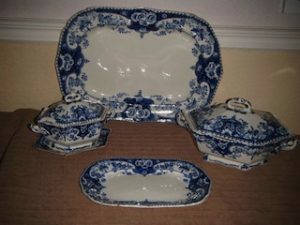 A collection of blue and white patterned 1920’s Melba kitchen accessories, to include two lidded casserole dishes and three various sized trays. 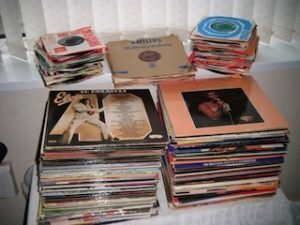 A large collection of vintage vinyl albums and singles, to include Elvis Presley, The Rolling Stones, Nirvana etc. 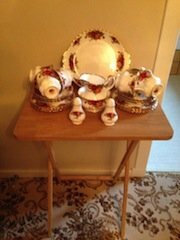 A large Royal Worcester Evesham patterned gold edged dinner set, to include a gravy boat, a milk jug, a cake stand, two lidded soup bowls, a teapot etc. 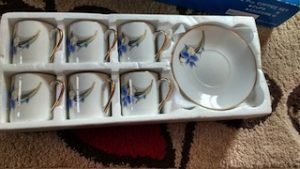 A brand new boxed gold and floral patterned part tea set, to include six mugs and six saucers. 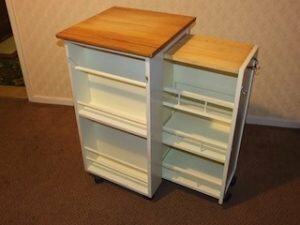 A tall standing white solid pine kitchen block with a pull out shelving area, on castors. 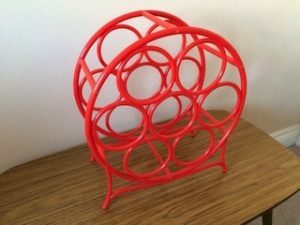 A hand painted red cast iron, circular retro seven bottle table top wine rack. 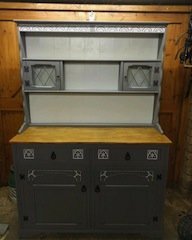 A tall standing hand painted grey solid pine kitchen dresser, having two shelves and two glass inlaid cupboards to the top, two drawers above two cupboards to the bottom. 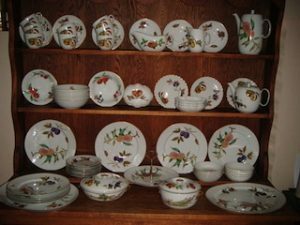 A 21 piece Royal Albert country rose patterned tea service, to include salt and pepper shakes, a milk jug, a sugar bowl, a tea tray, teacups, saucers and side plates. 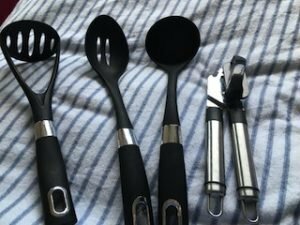 A set of four black plastic and stainless steel kitchen utensils, to include a potato masher, a ladle, an egg spoon and a tin opener. 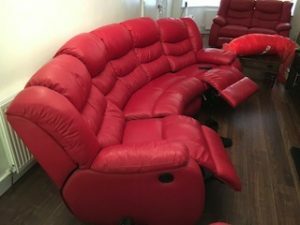 A four seater high back reclining curved back sofa and matching two seater sofa, upholstered in bright red faux leather. A hand painted off white solid wood television unit, having three drawers aside a glass inlaid double cabinet. 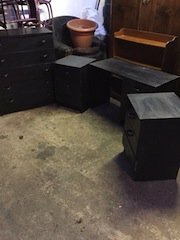 A four piece black painted solid wood bedroom furniture set, to include a tv unit, a pair of bedside drawers and a tall standing chest of drawers. 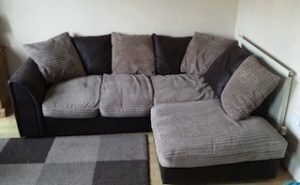 A four seater low back right hand corner sofa, upholstered in grey velour and black faux leather, together with a large grey area rug. 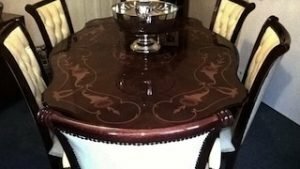 A large irregular shaped mahogany dining table, together with six matching high back dining chairs, upholstered in cream satin.